The smallest original silver denominations within the United States would see its designed altered following the two dates of issues for the prior series. The new design would be created by Robert Scot, based on sketches prepared by the famed portraitist Gilbert Stuart. The new rendition of Liberty was viewed more favorably and continued in use for a number of years, amidst an update of the reverse design. 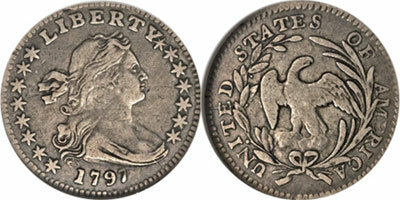 The obverse featured a bust of Miss Liberty with her hair flowing slightly back and bound by a simply ribbon. The word Liberty appears above with the date below. An arrangement of stars appears with eight to the left and seven to the right. In 1797, the coins curiously came with either 13, 15, or 16 stars. In the early days of United States coinage, it was attempted to add a star for each newly admitted state, but this soon proved problematic and designs reverted to the original 13 stars. The original reverse design was the same as the prior series with an eagle placed within a small wreath. After two years of issue, production of the denomination paused. In 1800 when production resumed, a new reverse design was adopted featuring a heraldic eagle adopted from the Great Seal of the United States. Typically, the first two issues from 1796 and 1797 are scarcer coins of the series and can be difficult to find in problem free condition. The undisputed key to the series is the 1802 half dime which had a mere 3,060 pieces struck. It is estimated that a mere 40 to 50 examples of this coin survive in all grades.